Last Wednesday started out as many other days have during our Nordic Tour. We woke up at a gorgeous campsite in Eidfjordvatent. After enjoying a tasty breakfast of fresh baked bread and Norwegian brown cheese we hopped in the van and made our way to the Voringfossen Waterfall. We were scheduled to be in Oslo that evening, with classes starting the following day and had decided to explore a little on our way there. The sun was shining, our spirits were high and we were feeling relaxed. Perhaps a little too relaxed. I was sitting in the passenger seat and had been enjoying a combination of looking at the spectacular Norwegian scenery, reading a book and dozing off. I was half awake when I heard Mark yell, and my eyes opened to grass and trees. We were no longer on the road. The van was moving forward, but it was also tipping in my direction, and soon it left the green and was on its side sliding across a dirt road. I could see the ground through the front window and was aware that it was next to the side of my head. While this was going on my reaction surprised me even then. I felt myself completely relax. It was as if my heart rate had slowed and I was watching a movie. I felt no fear. I felt no emotion, and I felt no pain. I remember thinking how strange it was that the capsize felt so smooth. Mark called out to me, but he was a voice in the background. I was unable to respond. In my head I rationalized that the van would stop soon, but instead it picked up speed. I remember thinking “this is bad,” and Mark’s shouts were becoming louder. He was saying, “I love you. I love you.” But I couldn’t respond. I could only watch through the window, the movie screen in front of me. 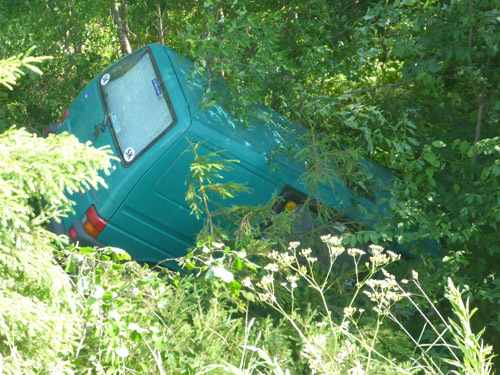 The van continued to slide, and then the dirt road was replaced by more grass, trees and a steep hill. Through the window I watched the scenery turn upside down, then the right way up and eventually stop. That was when I finally spoke. “We have to get out,” I said. Then I opened the door, climbed out, put my shoes on (which I don’t remember doing) and crawled on my hands and knees up the hill that we’d just come down. I was crawling through a dust cloud that the van had created but could see a woman at the top. She called down, and I assured her that there were two of us and that we were okay. Once at the top of the hill I sat down. I was struggling to get my breath and clear my lungs of the dust. Mark was next to me asking if I was okay. I noticed that my left arm was cut and bleeding, and was starting to feel the sting from the nettles that we’d crawled through, but I thought I was okay. Mark was having me bend joints, and I watched them bend, just as curious as him to see if the parts would actually move. Over the next few minutes we checked ourselves over, becoming aware of additional, but minor, injuries, while we waited for help to arrive. The fire department showed up first, followed by the ambulance and eventually the police. I realized that I was yawning and struggling to stay awake. Mark’s reaction was quite different, and he was trying to get back to the van and to the kayak rack (which had come off the vehicle, with the kayaks still attached). He wanted to see the damage and get some of our belongings. It was a hot day, and the paramedics asked me to move into the ambulance to get out of the sun, but when I stood I became very week. I was also aware that my neck felt week, and although it didn’t hurt, I was having a hard time holding my head up. Then I vomited. The paramedics strapped me into the bed in the ambulance and eventually we were on our way to the hospital. Because of the severity of the accident, the paramedics decided to take us to the big hospital, which would be better equipped to deal with any serious injuries that we might have sustained. This hospital was 120 kilometers away, and I stared out of the back window of the ambulance the whole time, watching lakes and trees pass by and trying to both stay awake and remember what happened. Mark was in the front of the vehicle, trying to figure things out in his own head. At the hospital we were checked over and then released, a package of painkillers clutched in my hand. I had a sprained right big toe, bruises up the left side of my body, a bruise across my chest from where the seatbelt had held me back, cuts on my left arm, two bumps on the top of my head, a bump on the side of my head and the beginning signs of whiplash, which emerged the following morning. Mark had bruises on the right side of his body, a bruise on his chest from the seatbelt, a bump and cuts on the top of his head, a cut on his right leg, a bruised right shoulder and bruises on his stomach. But other than that, we were okay. The van had been towed to a garage, and the following day we went to clean it out. The emotion that came from seeing the van can not easily be put into words. Parts of the front had caved in, and the front window was cracked in numerous places but had held. Mark’s door was jammed shut, so he’d evacuated the vehicle through my door. The sides of the van were indented, and the window behind my head had shattered from a tree that had impaled it. The back of the van had caved in, and the bumper was hanging. 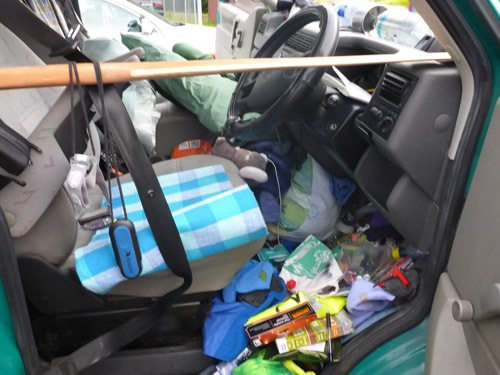 The inside of the van was equally, if not more, shocking. 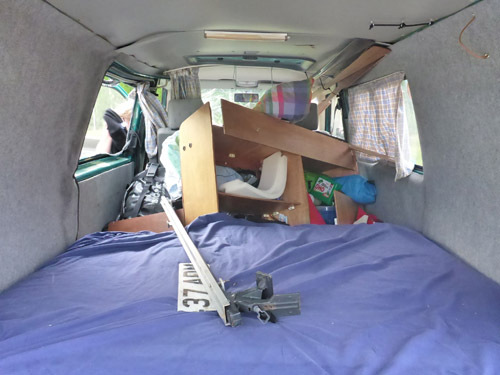 The cabinet system on the inside of the van had been ripped from the side and wedged behind the front seats. 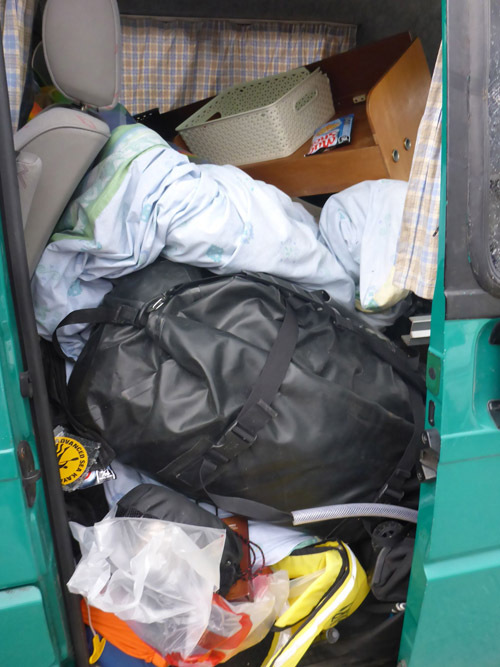 Everything in the van had ended up in the front, except for the larger objects, which had piled up behind the wedged cabinet. The roof rack had been placed next to the van, and on it were our two kayaks, snapped in half. In the days that followed, “what if,” popped into my head over and over again. What if Mark hadn’t closed his eyes for that split second which caused us to drift off the road? What if I would’ve taken my turn driving before he got too tired? What if we would’ve stopped for a few minutes so that both of us could have rested? What if I hadn’t been napping and kept Mark alert? These are all things that could have prevented the accident, but that’s what it was, an accident. Accidents happen, and they happen on days when we least expect them to. There is no blame, because an accident is an accident. Some accidents have smaller consequences, some have bigger consequences, but everyone has has accidents (vehicle or other) throughout their lifetimes. After the accident we received help from many people, all of who we are incredibly grateful for; the woman behind us who stopped and called for help, the firemen, paramedics and police, Marianne and Sabine at the campsite where we stayed, Ronny for helping us transport our things that were in the van and for putting us in touch with others who could help. Liv for getting us and all of our stuff to Oslo. Inge for housing us in Oslo. The Oslo Kayak Club for being so supportive, Johan for picking us from Oslo, taking us to Sweden and for loaning me his personal kayak for the rest of the tour, arranging a kayak for Mark for the rest of the tour and loaning us his personal vehicle. Ann for welcoming us into her house. And to everyone else who has showed us support and love over the past few days. The van where it stopped. Everything in the back of the van was tossed forward. Most of the van’s content’s ended up in a pile behind the front seats. The front of the van. Thank goodness you are both OK – all that really matters. The local kayaking community here in New England wish you a speedy recovery. It was wonderful how the local paddlers rallied to your assistance during this ordeal. Please be more careful next time when rolling! So glad you guys are “OK” relatively speaking. The kayak rolling is great, the van rolling not so. 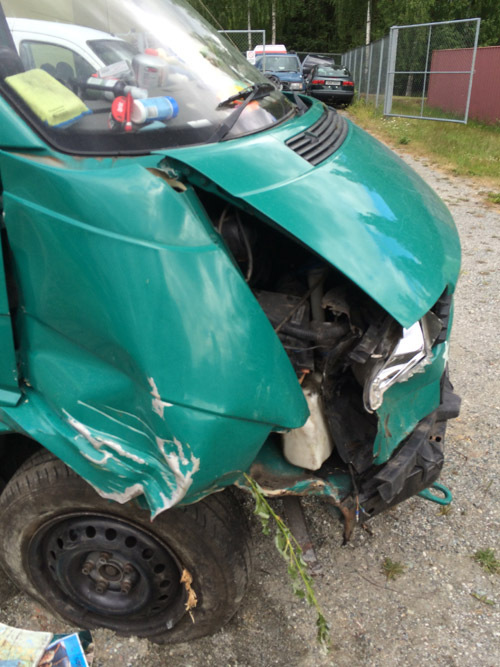 This accident and the support is a testament to the hospitality of the Scandinavians! So sorry to hear about the accident, but obviously glad that you were not seriously injured. What an ordeal. Best wishes from all your friends in Minnesota. It can happen to anyone! It ‘hard to hear that your partner tells you, “I love you, I love you”! a precious resource! ! You healed quickly and well! Be happy to be always together and in love. From here peacefully resume your trip and may be it beautiful and full of smiles and joy! Years ago I met a couple in Martinique in the restaurant (I had just arrived after sailing across the Atlantic and I wanted to celebrate with fresh food, vegetables and fruit), who celebrated with great joy at having escaped a serious accident where their car flew down from a mountain becoming a foil dish and they were flown out on the lawn before the ravine! Our hearts go out to you both! So glad you weren’t more seriously injured. Be well, take care and safe travels! A scary read, we forget how dangerous driving is because we do it all the time. I am very glad neither of you were seriously injured! All the best for a speedy recovery. So very glad you are okay….what a harrowing experience. Take your time and heal properly and completely! Best wishes for a speedy recovery! I’m so glad you two are okay. Best wishes. I’m happy to hear that you are both OK and wish you all the best from Canada. Sharing your story is probably good for your mental and physical recovery and it is a good wake up call for others who will read it. Thank you. You are a fabulous writer and inspiring paddling instructor. Namaste. Just heard about this and so glad you two are ok. Many times I’ve been on the edge of dropping off asleep on the way home, especially on one of those Anglesey and back in a day trips.